VI.7.23 Pompeii. December 2006. 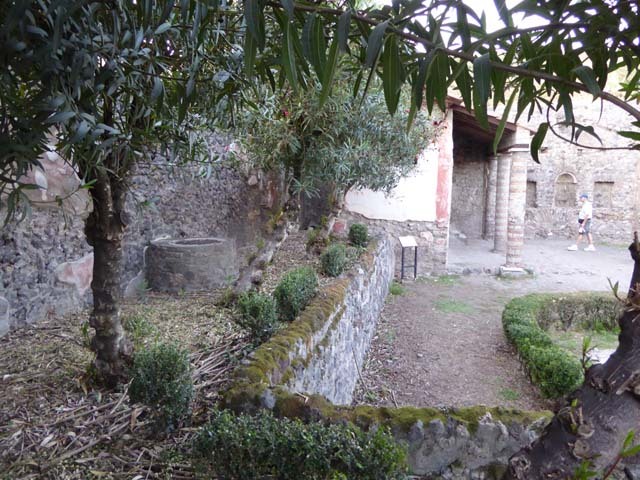 North wall of room to south of garden. VI.7.23 Pompeii. W.1179. Looking north-east to window and doorway to room with the marble window sill. 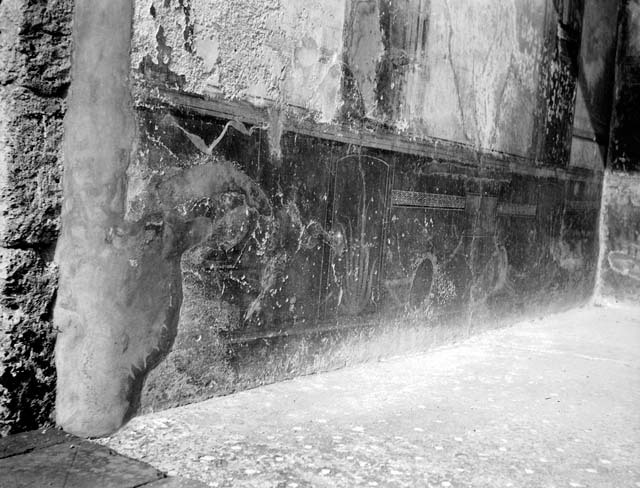 According to Bragantini, this wall showed a layer of preparation for the marble facing, with plugs of marble for fixing the nails. See Bragantini, de Vos, Badoni, 1983. Pitture e Pavimenti di Pompei, Parte 2. Rome: ICCD, (p.161). VI.7.23 Pompeii. December 2006. Looking north-east onto garden terrace from window. VI.7.23 Pompeii. December 2006. Steps down into garden. 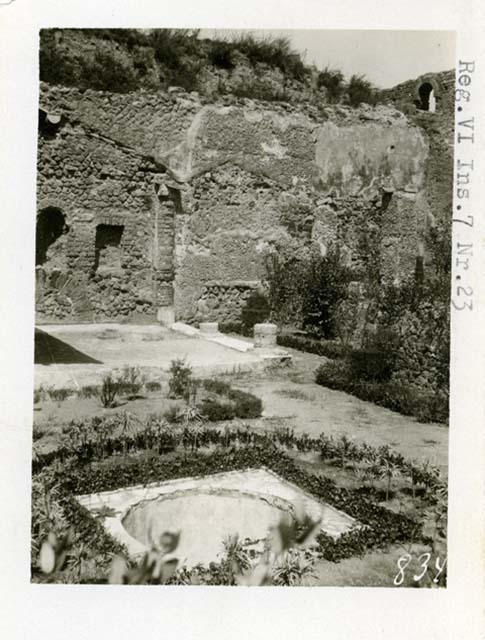 VI.7.23 Pompeii. December 2006. Looking north into garden. VI.7.23 Pompeii. 1972. 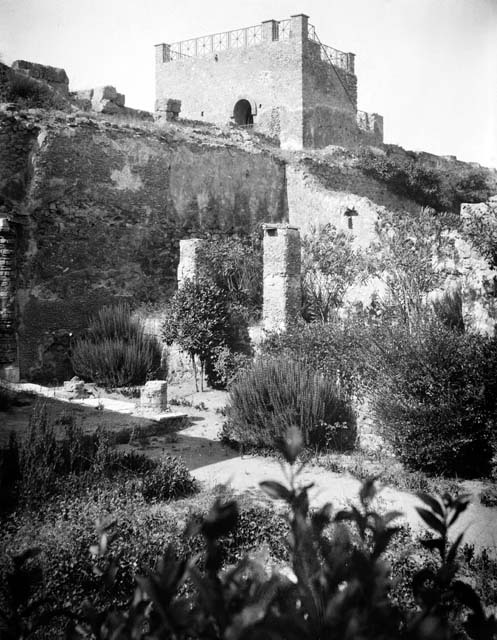 Looking towards east side and south-east corner, with steps up to house, on right. Photo by Stanley A. Jashemski. 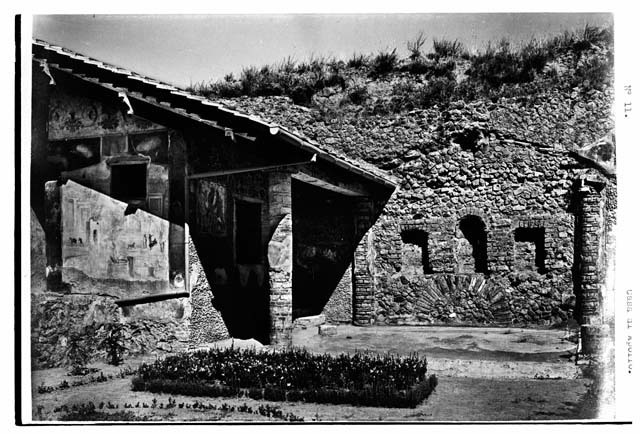 VI.7.23 Pompeii. September 2005. Looking west across garden. 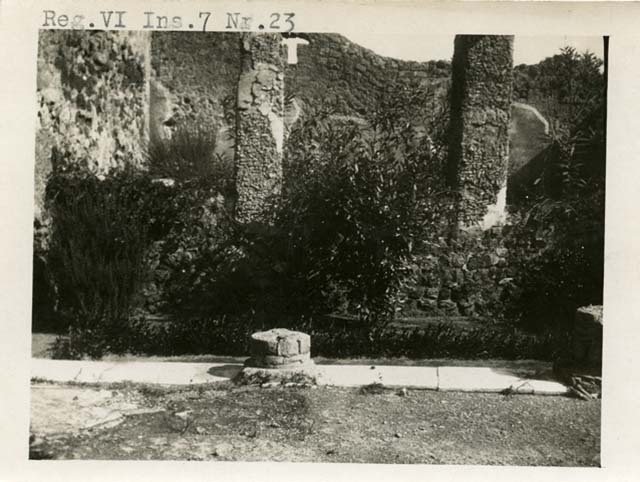 VI.7.23 Pompeii. December 2006. 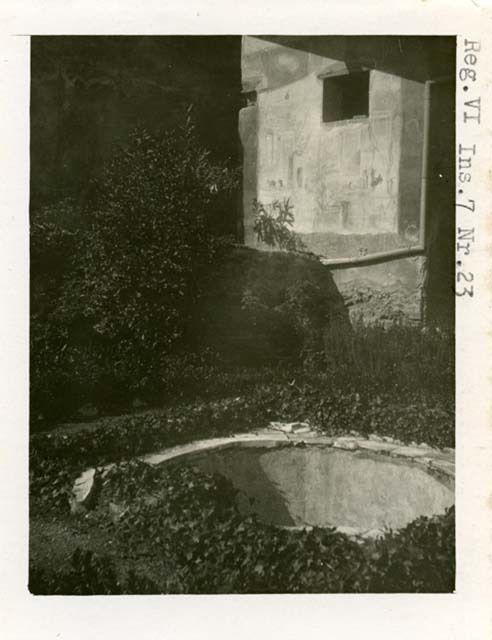 Garden showing painted plaster walls and the two levels of the garden. 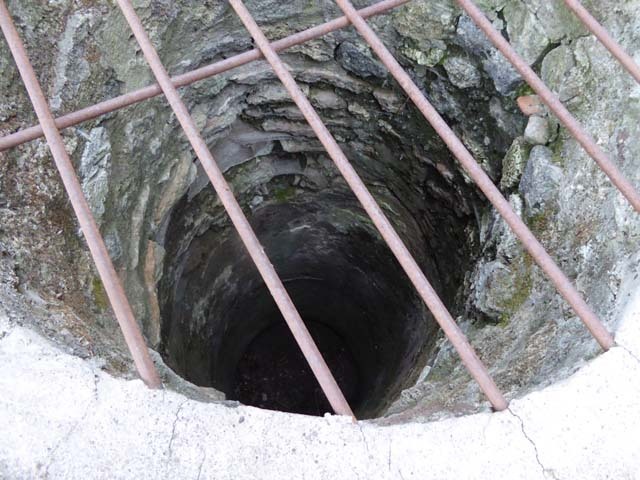 The upper was probably a terrace and the lower containing a fountain. Looking towards south-west corner. VI.7.23 Pompeii. W.1188. According to Warscher, this shows the remains of wall decorations from the terrace. 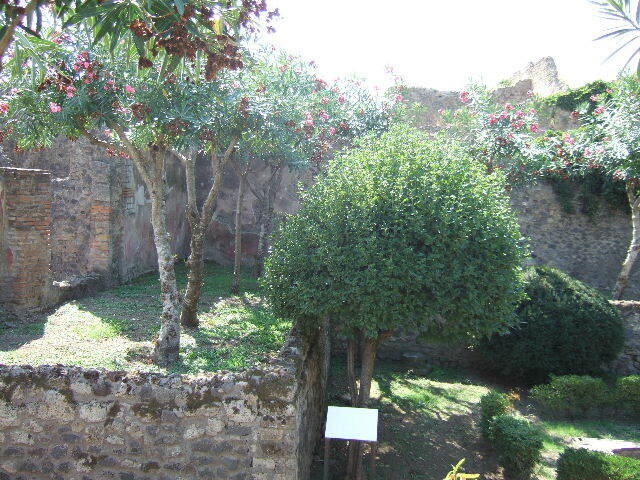 According to Bragantini, this shows the south wall on the west side of the garden area. The dado was red and showed a dolphin, a sea panther, and a mask with horn and modius in yellow. The middle zone was also red and showed a statue on a pedestal. VI.7.23 Pompeii. October 2014. 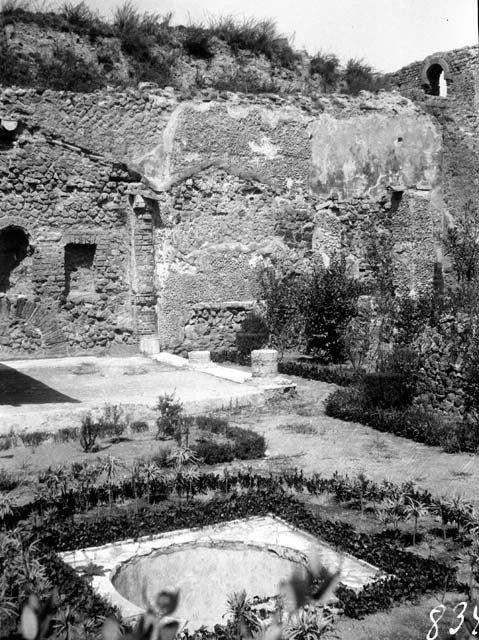 Looking north across garden terrace towards the well, on the left, and cubiculum, ahead. VI.7.23 Pompeii. October 2014. 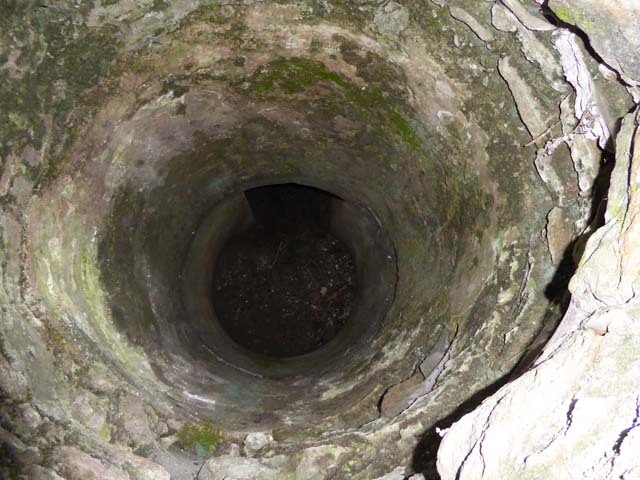 Well, near west wall of garden terrace. Photo courtesy of Michael Binns. 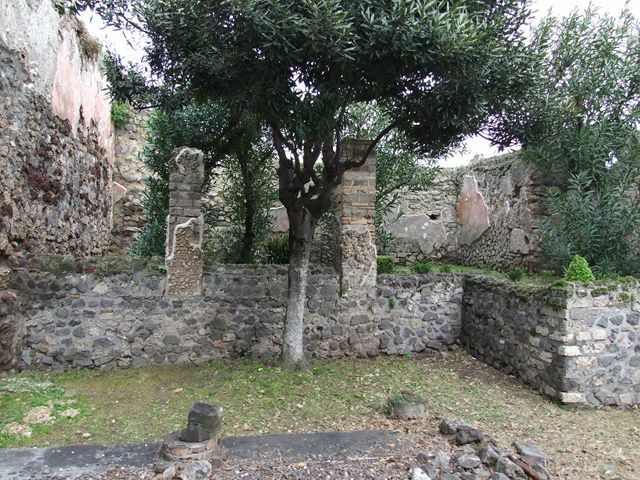 VI.7.23 Pompeii. September 2005. Looking west across garden from VI.7.25. 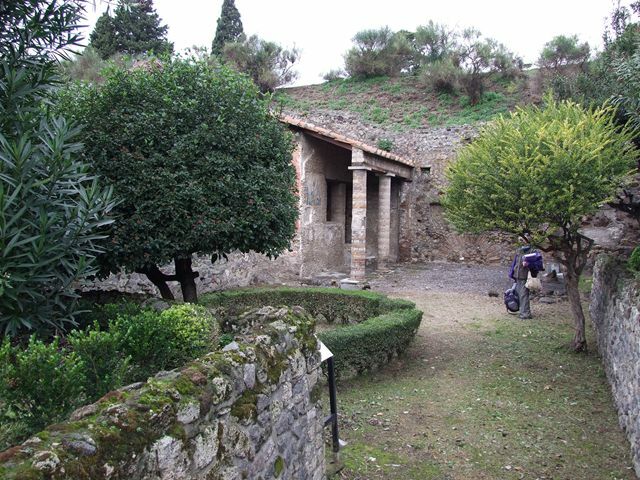 VI.7.23 Pompeii. 1937-39. Looking west across pool in garden area. VI.7.23 Pompeii. December 2006. 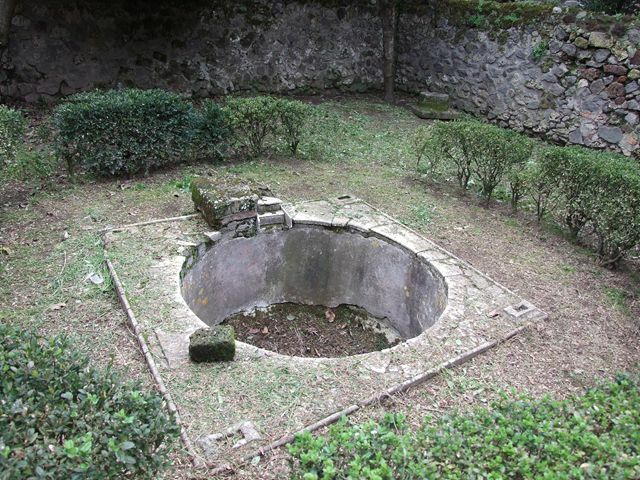 Garden fountain. 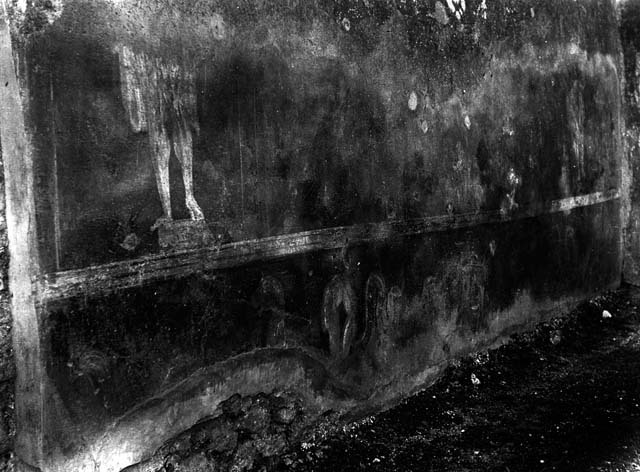 VI.7.23 Pompeii. W.1585. 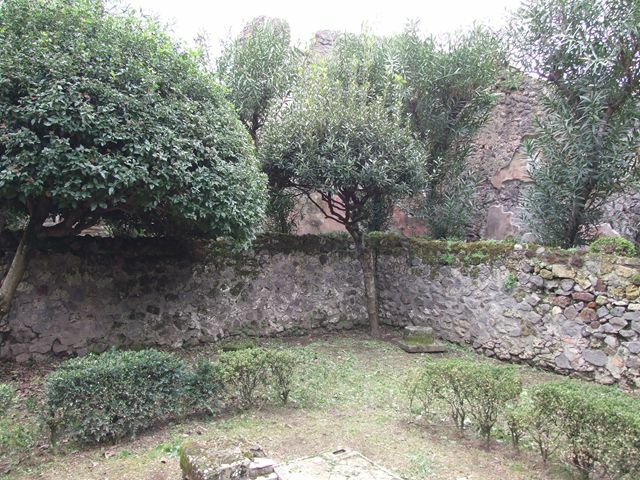 Looking north across garden to summer triclinium. VI.7.23 Pompeii. W.1182. Looking north-east across garden. VI.7.23 Pompeii. 1937-39. Looking north-east across garden. VI.7.23 Pompeii. W.1184. Looking north-east across garden towards Tower XI. VI.7.23 Pompeii. December 2006. 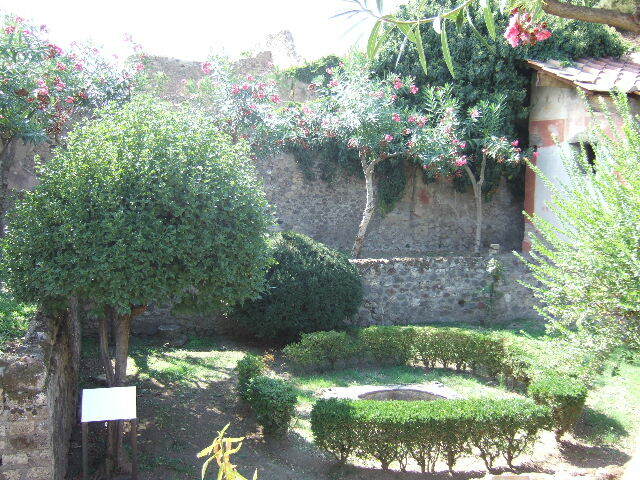 Looking east from summer triclinium showing painted plaster walls of garden. 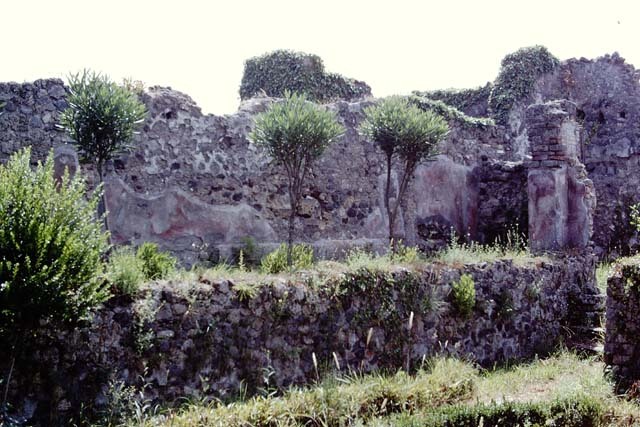 VI.7.23 Pompeii. 1937-39. Looking east across garden area. We are dubious about this description but having searched many books, we cannot prove a better description or location. The floor would seem to fit the description of the north side of the tablinum. It is such a beautiful picture, it would have been a pity not to show it !